Accurate Box Company has three BOBST laminators. 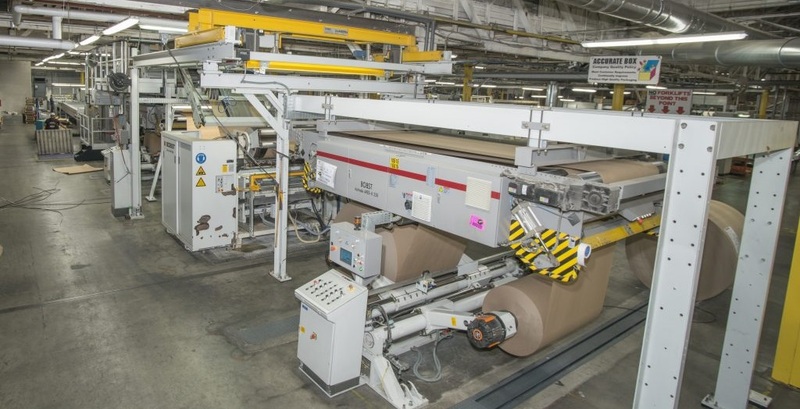 The most recent MasterFlute is the latest generation of Asitrade high performance web to sheet laminator that runs with higher speed, increased accuracy, and minimized waste. Accurate Box Company has available capacity for your E, B, and F flute corrugated packaging. Our ability to run many different liner and medium grades allows Accurate Box to produce packaging with a wide range of edge crush test (ECT) and compression values. Accurate Box Company also has the ability to apply specialty coating and tape to the inside of your box. Our expertise in this field allows us to make the bold “No-Warp” guarantee. This guarantee ensures your packaging will run at maximum efficiency on your automated equipment, ship well once palletized, and retain structural integrity throughout the retail or wholesale club store process.